Whether the timing of the trade surprise was intentional or not, President Hu will be arriving in Washington on January 19th for his official state visit. There is usually no mystery to these significant data surprises. President Hu’s visit is a big deal because it is his first “state visit” since 2006, even though the two leaders have met a number of times in the past. It should be no surprise that President Obama will be pressing China to revalue its currency but these carefully negotiated summits are more about expanding cooperation and promoting partnership. President Hu will also be able to point to the latest trade numbers and say that his hands are tied because of slower export demand. In all likelihood, the trade surplus will increase once, just like it did between April and June of last year. 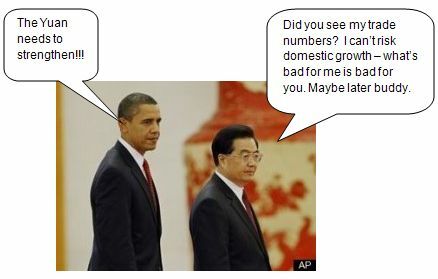 A week before President Obama was set to meet with Hu Jintao, China reported its first monthly trade deficit since 2004. Coincidence or not, I leave that for you to decide.